Are you thinking of quitting your job? Whenever possible, it is always best to resign in person, and then follow up with a formal resignation letter for your employment file. However, sometimes circumstances come up that require you to send a resignation email. For example, you might have a sudden family emergency, and have to tell your employer that you are leaving as soon as possible. When that happens, you need to notify your manager that you’ll be leaving, and do so professionally and courteously, so as not to burn any bridges. Quitting your job can be an opportunity to strengthen relationships and build your network – if you go about things in the right way. A well-crafted resignation email can help. Email your employer. Send the email to your boss, but also carbon copy (cc) the Human Resources office, so that they can keep the email on file. You may also choose to send a copy to your personal email for your records, in case your soon-to-be former employer cuts off access to email. Give two weeks’ notice. If possible, give your employer the standard two weeks’ notice when you are going to quit. If that is not possible, give the employer as much notice as possible. This will help you maintain a good relationship with your former employer. State the date. In the letter, include the date you plan to leave the company. This will give your employer a clear sense of your timeline. Don’t go into details. You do not need to give details on why you are leaving, or what you will be doing next. You want to keep your letter brief. Express gratitude. This is a good opportunity to express your gratitude for the years you have worked at the company. If you are very unhappy with the company, do not complain or say anything negative in your letter. You want to maintain a good relationship with the employer, especially since you might have to ask him or her for a letter of reference in the future. Offer assistance. If you are able to do so, offer to help the company with the transition. You might offer to train a new employee, for example. Ask any questions. This is also an opportunity to ask any questions about compensation or benefits, such as where or when you will receive your last paycheck. You should send the email to both your employer and to the Human Resources office. Human Resources will be able to answer these kinds of questions. Provide contact information. Include any non-company email address or another form of contact information that you want to include, so that your employer can get in touch with you. This is especially important if you are leaving right away. You will lose access to your work email address when your employment ends. It is a good idea to review resignation email examples before writing your own. 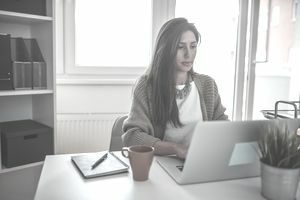 Examples can help you see what kind of content you should include in your email (such as an expression of your gratitude, or an offer to help the company with the transition). You might also look at a resignation email template to get a sense of how to lay out your letter, and what to include (such as introductions and body paragraphs). While examples, templates, and guidelines are a great starting point for your email, you should always tailor the email to fit the company and your situation. Please accept this message as notification that I am leaving my position with ABCD Company effective September 15. I appreciate the opportunities I have been given at ABCD and your professional guidance and support. I wish you and the company the best success in the future. In the future, you can continue to get in touch with me through my non-work email, firstname.lastname@email.com, or my cell phone, 555-555-5555. Regretfully, I must submit my immediate resignation for personal reasons. I have enjoyed my time at XYZ Corp and will miss working with you and our team. I’m proud of the work we’ve done. Thank you for your support and mentorship these past five years. I know that my leaving so quickly will likely create some difficulties; please accept my sincere apologies and help in the transition. I’m happy to help screen replacement candidates and/or assist in training my replacement via video conferencing. If you have any questions, please feel free to contact me at my personal email (email@email.com) or via phone at 555-555-5555.